Rather unfairly, we expect the Criterion Collection to define significant cinema, all on its own. When the company released Michael Bay's Armageddon on DVD, for example, I recall a great disturbance in the (cinephilia) force. How dare they cheapen Art with Commerce!!! Of course, Criterion had already released John Woo's The Killer and Hardboiled on DVD by that point, as well as Suzuki Seijun's Branded to Kill and Tokyo Drifter, but though those films displayed a populist bent, they were critically-acclaimed and above the fray, as it were. As time passed, and the Criterion Collection's releases grew into the hundreds, the disquietude about Bay's early representation on Criterion dissipated. On the Asian cinema scene, however, I believe there has been more consternation and/or disappointment that the company appeared to focus more on European cinema than films from other regions. Some of that is surely because of the company's pre-existing contracts and contacts, and the mind-boggling vicissitudes of the home video market, which I have never, ever understood in the slightest. In time, the company released a steady stream of films by acknowledged Japanese masters (Kurosawa, Ozu, more Suzuki, samurai movies, Naruse, Ichikawa, Imamura, Mizoguchi, Teshigahara) to the home video market. Wong Kar-wai's In the Mood for Love received lovely treatment, and later so did Edward Yang's Yi Yi (at last!) and Wong's Chungking Express, and then Lee Chang-dong's Secret Sunshine and then Kim Ki-young's The Housemaid. More recently, King Hu's masterful A Touch of Zen saw release, and then Apichatpong Weerasethakul's Mysterious Object at Noon and then King Hu's wonderful Dragon Inn. Finally, though, the door has been cracked open! 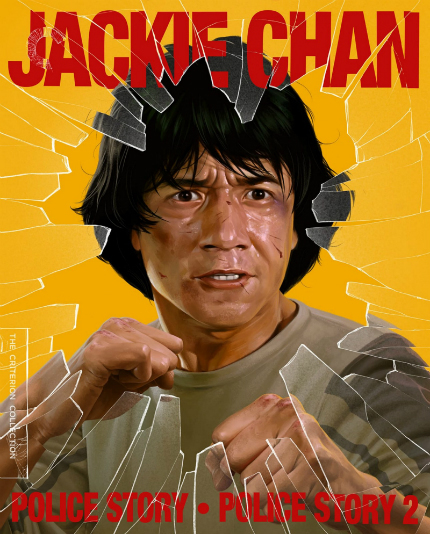 Jackie Chan's Police Story and Police Story 2 will see release on Criterion in April 2019. The Blu-ray will feature new 4K digital restorations, alternate 5.1 surround and English-dubbed soundtracks for both films; the Hong Kong-release version of Police Story 2 will be "presented in a high-definition digital transfer for the first time." Especially noteworthy are "new programs on Chan's screen persona and action-filmmaking techniques, featuring author and New York Asian Film Festival cofounder Grady Hendrix," whose extensive knowledge and boundless enthusiasm will be most welcome. Other features include: "Archival interviews with Chan and actor and stuntman Benny Lai," "Television program from 1964 detailing the rigors of Peking-opera training, akin to the education that Chan received as a child," Chan stunt reel, trailers, new English subtitle translations and "More!" Of course, these films have been released on home video in the past, possibly with great transfers and extras. But I will be very glad to invest in new copies, so as to hear Mr. Hendrix and to glory again in the glory days of my nostalgic youth (relatively speaking). Other films will be released by Criterion in April 2019 as well, including Elia Kazan's exemplary A Face in the Crowd, Jan Němec's Diamonds of the Night, and Gillian Armstrong's My Brilliant Career, plus Jim Jarmusch's Stranger Than Paradise and international "taxicab odyssey" Night on Earth (which I watched six times over one weekend). See all details on all those new releases at the official Criterion site.